Home» AP LATEST UPDATES | EDUCATIONAL PORTAL » AP LPT Telugu And Hindi Pandits Annual Examination TimeTable Scheduled - 2015. 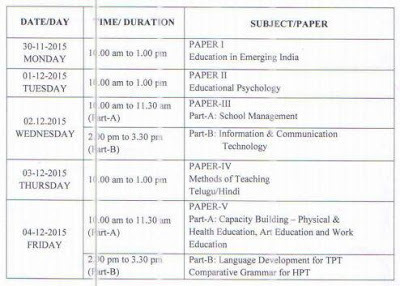 AP LPT Telugu And Hindi Pandits Annual Examination TimeTable Scheduled - 2015. AP LANGVAGE PANDITS (TELUGU / HINDI ) ANNUAL EXAMS TIMETABLE - 2015. AP LPT Telugu and Hindi Annual Exams Time Table Scheduled : AP LPT Exams Scheduled : LPT Examination Scheduled - 2015 ' LP telugu and Hindi Examination Timetable. AP Director of school education conducting 2014 Batch Annual Exams On 30/11/2015 to 04/12/2015. The exams Held on Part - A and Part - B, Part - A Exams Started from 10;00 A.M to 1:00 P.M , Part - B Exams Started from 2;00 P.M to 3:30 P.M. Annual Exams On 30/11/2015 to 04/12/2015. The exams Held on Part - A and Part - B, Part - A Exams Started from 10;00 A.M to 1:00 P.M , Part - B Exams Started from 2;00 P.M to 3:30 P.M.